Did this really happen? 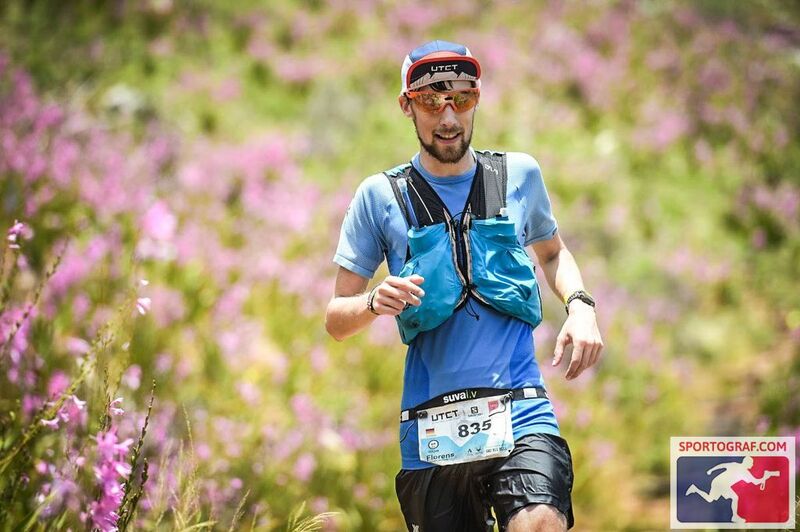 Did I finish my first ultra race in only 7h42 and in 6th position overall? What a day it was! While many runners, including the big names in the 100km race, dropped out one after another, I was escaping bad patches entirely. Don’t ask me how! The following is all I know. It was the biggest running challenge I was facing so far. Hence, not so much to my surprise, I got quite nervous while walking to the start early in the morning at around 4:25 am. However, seeing a lot of familiar faces and standing in the start corridor waiting for the „3,2,1, Go“, I calmed down, despite not knowing what’s ahead. Was I that confident in my training and abilities? I started purposefully a bit further back as I’m always tempted to head off with the front pack, but this time I wanted to conserve my energy for the unknown last kilometres. Guess, how long it took me to be at the front of the race? Exactly, maybe 300m and I found myself running in 4th position, but still with a controlled pace (at least for a road runner) on the tar downhill through the awakening city. As we hit the trails, I was expecting the avid trail runners to pass, but it didn’t really happen. I passed the first aid station on top of Signal Hill without stopping at 6 am. Together with Markus, another German, I ran towards the next aid station, giving him a little city tour. At Kloof Nek, the next aid station, Matthew, my personal supporter, and many other familiar faces welcomed me. We quickly exchanged one of the water bottles, I had a sip of coke (I actually questioned myself for drinking coke at 7 am in that moment) and off I went together with Markus. „Two runners have passed us in the aid station“, he told me. But for me, it was never about the position in my first ultra. Already in the weeks and days leading up to the race, I kept on telling myself, that I’m not going to race for positions but only myself. I even told Jonathan, a local friend who told me to be at the main climb, that he shouldn’t tell me my position. Was I surprised, that that was the first comment I got to hear? Not really! I felt surprisingly well leaving the Kloof Nek aid station even though we already ran for almost two hours and had covered roughly 19km and 800m D+. 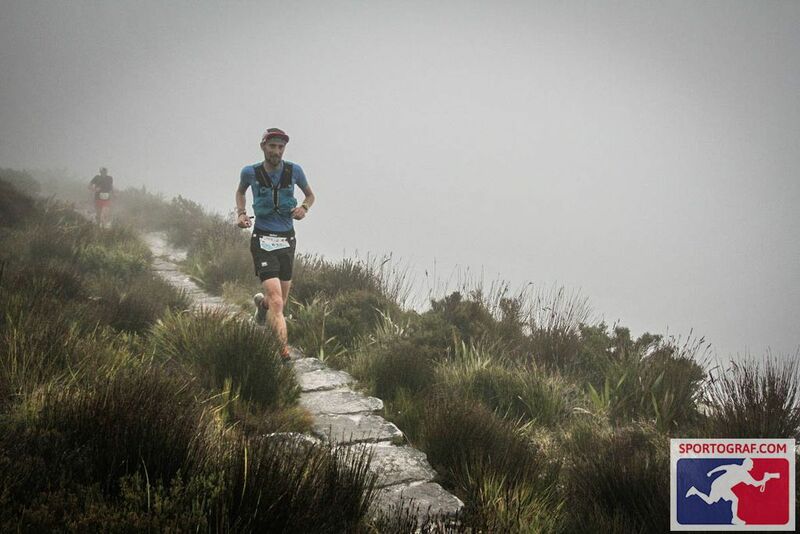 On the way up to Kloof Corner, I saw Kyle with a camera and jumped ahead with big strides for a proper photo. That was also the moment when I dropped Markus. The last steep stairs to Kloof Corner I felt like a Tour de France cyclist climbing Alp d’Huez. Lots of supporters, drums, cowbells, cheering. Special! Very special! Thanks so much, Charles, Mark & friends! Reaching the contour path, a fairly flat section over 1.5km before reaching the main climb of the day, I pushed hard. This is where you can make up time. The number of 100km runners I had to pass increased, so I had to sit back from time to time and wait for the possibility to pass on this narrow single trail. 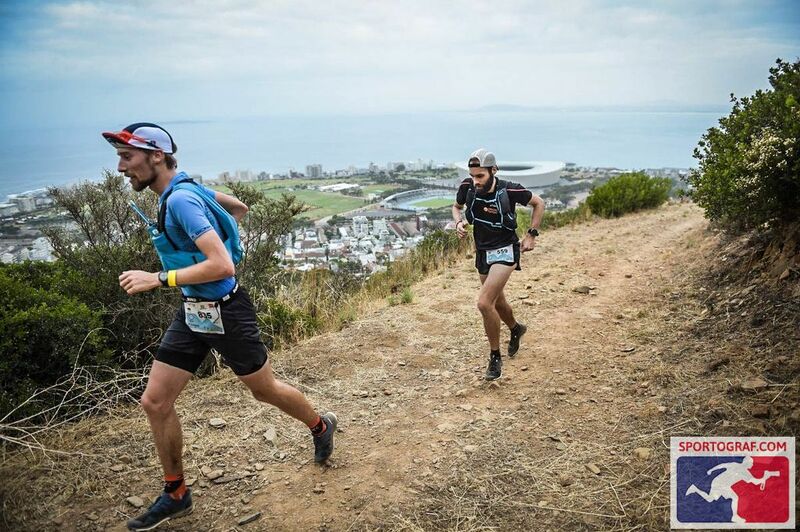 Once at the famous Platteklip climb, Jonathan joined me and updated me about the race development in the 100km race. It was great to have some distraction from my own run and chat with somebody familiar. Halfway up he turned around to run up again with others afterwards. Thanks so much, buddy! At the point when Jono turned around, I heard the sound of bagpipes further up the gorge. What a treat, Piper Mike! The music echoed through the gorge and so did the clapping of the runners once he took a little break to warm up his fingers. More familiar faces, like James & Helen, on top of the climb made me smile and once I reached the fairly flat table which was covered in mist, I pushed it again. Just before the highest point of the race, I passed Doylie, who I seconded during her 125km race at the UTMB in August. We ran on narrow boardwalks and suddenly, I heard a loud scream behind me. When I turned around, I saw Doylie sitting next to the boardwalks holding her leg. She had stumbled and fallen on a nail sticking out of the boards causing a big wound underneath the knee. I tried to call the emergency but neither her phone nor mine had reception. George, a Swedish triathlete stopped as well and helped with the bandage, while Doylie kept on saying that I should continue as I was in a superb position. I didn’t care. As I said, it was never about the position for me. Eventually, another runner had reception and called the emergency and simultaneously, other runners who had passed us alerted the medics at Macclear’s Beacon. Wrapped in her rain jacket and a space blanket and knowing that she’d be taken professional care of, I ran off. I’m not racing and running for positions. I’m running my own race! The raised adrenaline from this shock made me push again, trying to make up the lost time on one of the most technical parts of the route. However, my effort was always controlled and despite hitting rocks with my foot I was never in danger to fall. 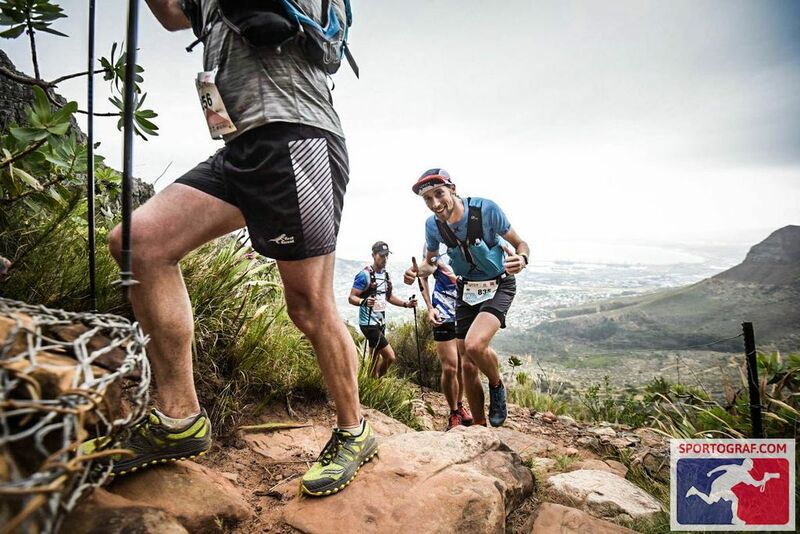 At the next aid station, the Scout Hut on top of the Table Mountain, I took the time to adjust the lacing knowing that a long downhill was coming up. I didn’t spend too much time in the aid station. 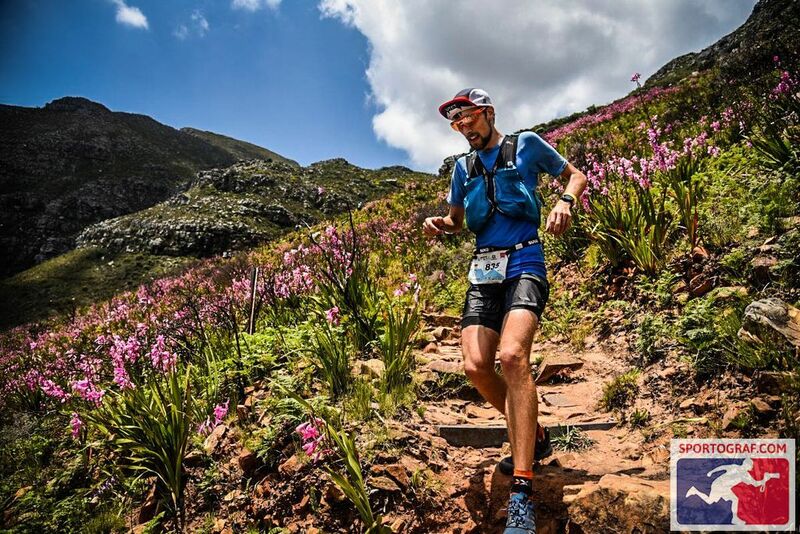 Very much to my surprise, neither the 35km leaders nor Lucas, a strong local trail runner who I was expecting in front of me, had passed me until now. I was constantly expecting them to pass me. Was I running too fast? But I felt good and no fatigue at all, so it can’t be too fast, can it be? Anyway, I continued and ran as I felt. After the long downhill towards Constantia Nek, I turned into the vineyard section. This was the only part of the route which was unfamiliar for me. It was certainly a lot more up and down than I expected and slowly but surely, I felt the fatigue in my legs. Simultaneously, the heat rose more and more. Are those cramps starting in the back of my left thigh? A French runner from Reunion closed the gap to me and we were running together for a while chatting to each other. It distracted me from thinking too much about the tired legs, even though I had to stop for a short moment to stretch them. I remembered Michelle’s words to take in electrolytes as soon as I feel something, so I had the first salt capsule and a second one just afterwards. At the Alpen Trail aid station, about 42km into the race, I took my time. I changed the shirt, which Matt had wetted in the close-by stream, got a lot of ice in my cap and swopped the flasks prepared with Maurten. The officials also checked whether I had the compulsory gear with me. All there, I was good to go. Leaving the aid station, Matt joined me for a few hundred meters until it was only me left on the trails. It was a long way up through the Greenbelt, past Cecilia Forest, following the Contour Path above Kirstenbosch all the way to the top of the so-called 400 steps. Just before the Contour Path, I closed the gap to Gabriel again, who had passed me in the Greenbelt. We chatted for a moment before I decided to walk while he kept on running. The reason, I’m mentioning this, is that after finishing we sat close to each other and he started chatting to me, telling me that he had passed me after Alpen Trail. However, I couldn’t remember anybody passing me on that section at all. Only the next morning, I remembered that we were even chatting and he was telling me where he’s from. Crossing the bottom of Nursery Ravine, the Contour Path filled up again with runners from the 35km race. I passed whoever showed up in front of me and, after a while, descended from the Contour Path towards UCT, the next and last aid station. I know this section very well, and seeing my progress made me happy. Suddenly, it was only 10km to go! The UCT aid station was amazing! Again, Matt exchanged the flasks prepared with Maurten and gave me the Maurten HydroGel and the Aktiv3 Liquid Energy, which I had prepared for the last 10km. Before leaving, I got a big cup with Red Bull mixed with ice cold water as well as ice for my cap and the volunteers wrang out big sponges with ice cold water above me. What an amazing feeling! Together with Matt, I walked out of the aid station, drinking the Red Bull and knowing that one last steep climb, the Mowbray Ridge, was waiting for me. Several 35km runners passed me leaving the aid station, but as soon as we had to climb, I collected one after another again. Once I reached the Blockhouse, we hit the Contour Path. With every bend the city opened up more and more. But I was primarily focused on my feet and what’s in front of me. Looking at the watch, I realized, that a sub 8h would be more than possible and I got a bit emotional. „Bring it home first, buddy!“, I told myself. I’ve run this trail so many times already but never did it feel this hilly and long. Finally, I reached the turn which started the downhill. A few stairs, a little tar road section and then a long downhill on washed out jeep tracks. The closer I got to the finish, the more often I had to keep telling myself to bring it home. Not even a kilometre from the finish, we crossed a stream and I couldn’t resist stopping for a moment to quickly dip my cap. Such a great feeling with the cold water running down your body. It was very hot at that time. Surprisingly, approaching the finish, my legs felt better again and running up onto the rugby field made me super happy. Two more bends and I’m on the final stretch. Running through the Red Bull arch, between two stands and across the line. YES! I’ve done it! My first ultra! And what a day it was! A big thank you to Matthew for his support all day through! That was such a great help and without you, I would have spent much more time in the aid stations as well as carry all the stuff around through the entire race. Additionally, it was super motivating to see a familiar face at the aid station and even have company walking/running out of it. A big shout out to all the volunteers and supporters along the way! You made this race very special! The Cape Town trail community is simply magnificent and super special! 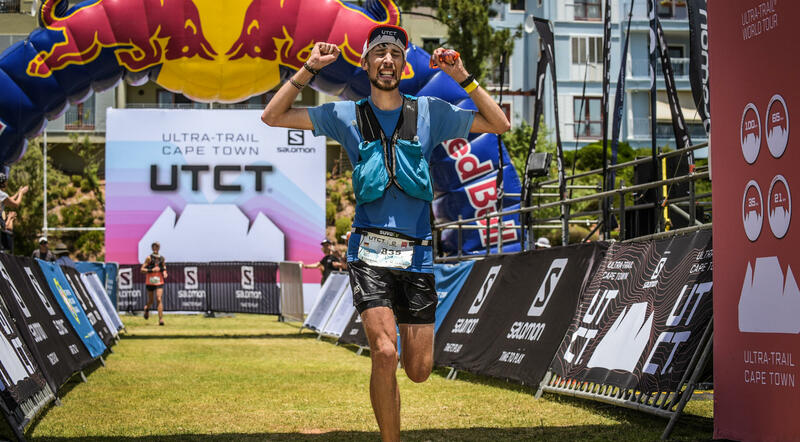 Then, obviously, a big thank you to Ultra-trail Cape Town – UTCT and the entire team behind Stuart & Nic as well! What you achieved in the past years is stunning! 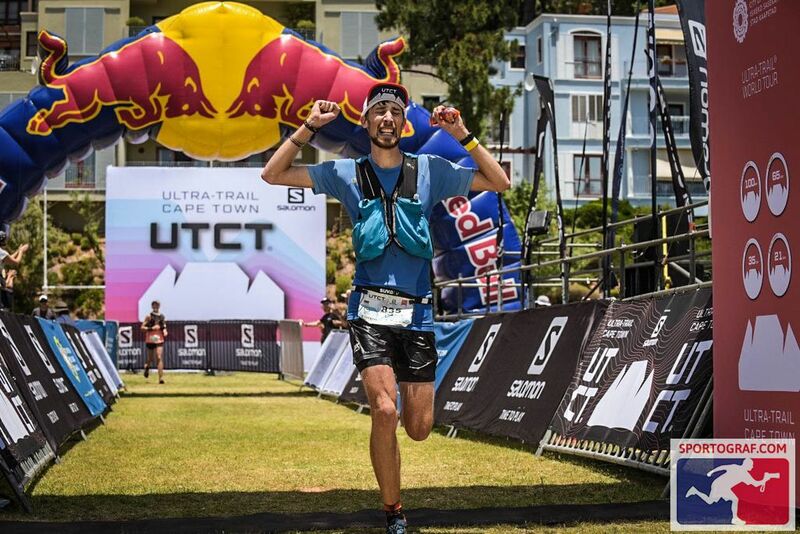 By now, UTCT is not just a race or event anymore. It is a virus spreading the world more and more! Congrats to every runner who had the guts to line up in the morning! 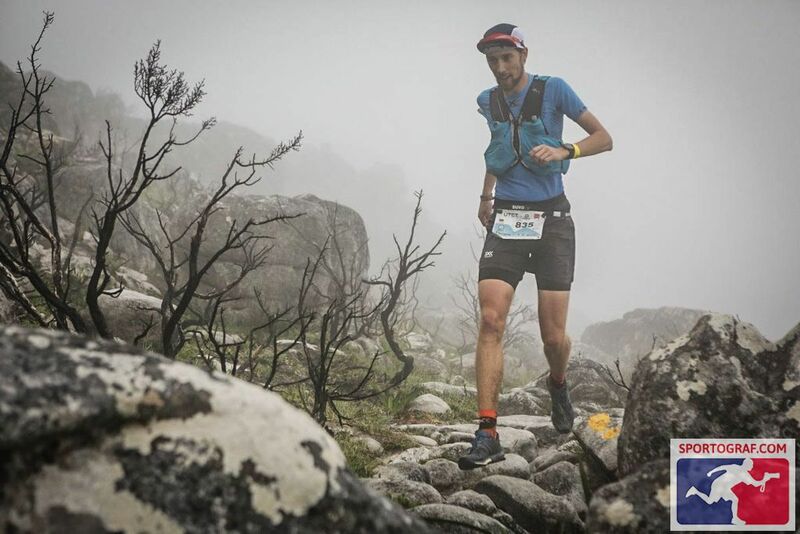 A trail race like this, no matter the distance, is not a joke. Some had to pull out along the way, but that’s simply the nature of such races and especially under such conditions. After all, it’s not a walk in the park! 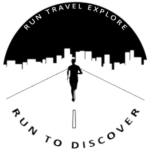 Next PostHow to train for your first ultra?